In Intervals, Marc Audette and Barbara Steinman draw us into the creation of their vivid and enthralling multi-media installations. 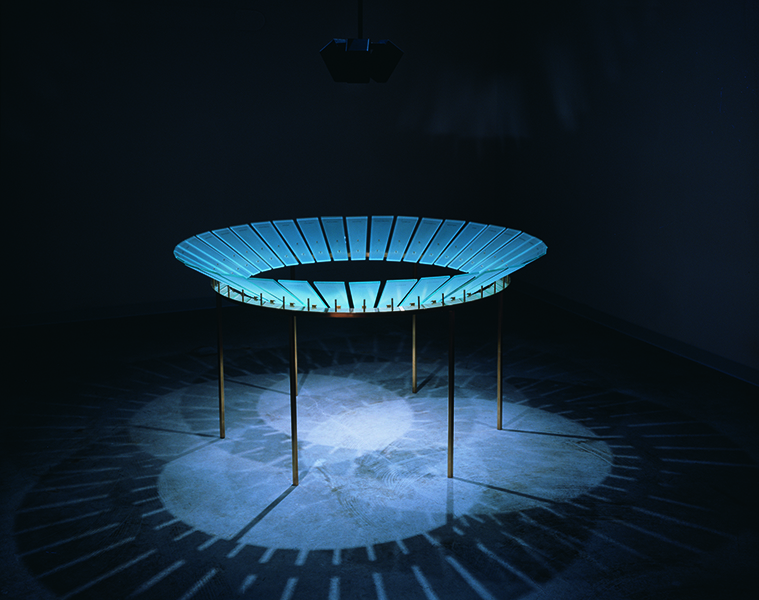 Barbara Steinman’s Roulette (1993) is a sound sculpture in brass and glass in which a metal ball is heard spinning over the surface of a roulette table. The glass elements cast intricate patterns of light on the floor – proto-photographic images as ephemeral as the sound. In Tablets (2005), Steinman has etched waveforms of spoken words into clear glass panels, enabling the spectator to consider sound with presence, and presence without sound. In the works of Audette and Steinman, intervals created by technological means are filled by the imaginative participation of the spectator. Barbara Steinman deals with issues of tolerance and the fragility of boundaries in her work. She has exhibited at the Museum of Modern Art and the Jewish Museum in New York; in Amsterdam, Boston, Liverpool, Tokyo, and Troyes, France; and in the biennials of Tokyo (1985), São Paulo (1987), Venice (1988), Berlin and Cologne (1989), and Sydney (1990) and Seoul (2000). Her practice has expanded to include large-scale, permanent, outdoor commissions, where she works with landscape architects to create “urban interludes” – contemplative green spaces in downtown Toronto and Vancouver. In 2002 she received the Governor General’s Award in Visual and Media Arts.